The Boston Chapter of the User Experience Professionals’ Association is a highly active community for persons with individual and professional interests in usability, user experience design, and their many related fields. 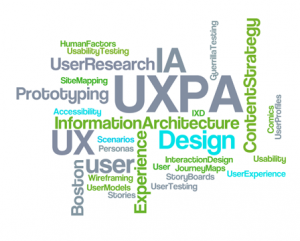 UXPA Boston is a regional chapter of the User Experience Professionals Association (UXPA). Membership to UXPA Boston is free. We have over 4,500 members, and continue to grow. Our annual conference attracted over 900 attendees in 2016. Join now to attend user experience events, receive job listings, and become part of the vibrant Boston user experience community. Our monthly meetings feature lectures, demonstrations, jobs discussions, tours of host companies’ proprietary labs and more. The UXPA Boston Annual Conference is held each May at the Sheraton Boston Hotel. Learn how to apply to be a Speaker here. Apply to be a Submission Reviewer here. Specialized Saturday workshops given by members provide in-depth half- and full-day tutorials on a variety of topics from research techniques to mobile device design.